When NintendoDS, GBA, NGP, and WS, etc. are dumped out, the dumping out machine must be necessary. I think that it can do the thing obtained by the auction etc. Now though most machine has disappeared excluding DS. It explains the method of dumping out NDS that can be comparatively obtained this time. 2.Because the main body of compressed by "RAR" form, it defrosts with free software etc. that can defrost RAR. 3. "Dumper.nds" is copied onto SD or CF by way of card reader as shown in a left figure below. 4.The console software of M3 is renewed to a thing latest. 5.updates the firmware of PassKey to the latest thing. It is a thing that doesn't become it as long as here doesn't do first. 6.The game that wants to be sucked out is inserted in PassKey, and inserted in the DS slot of the main body of DS. Sucking out is finally begun here. 3.Check out the M3's Menu!! 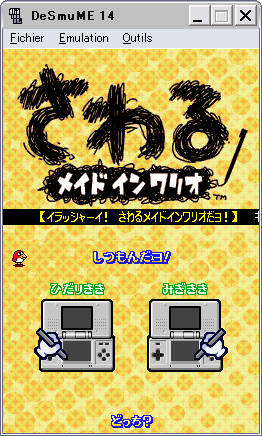 8.If the switch of DS is first turned on and the M3 menu in a left chart comes out, it is start OK.
9.The game icon left chart is selected, and it is confirmed that there is "DUMPER.NDS" file. 10.It enters the Dumper menu pushing A button when "DUMPER.NDS" file selected. 12.confirms whether the game that wants to be sucked out again sticks neatly in DS, and will push "Select" button. 13.Because the confirmation screen in a left chart comes out when "select" is pushed, let's start sucking out pushing "A" button. 14.Let's wait until ending while sucking it out like the center of left chart because the indicator comes out. 15.Because the command in the figure below comes out when sucking out ends, let's pull out PassKey and insert only an original game in the main body of DS. It is sucking out completion by this. Because the folder of "CleanRomDump" is made in SD/CF, the file sucked out in that is made after this.